Many steep hillsides in the Marlborough Sounds and adjacent ranges were planted in exotic forest from the 1970s. 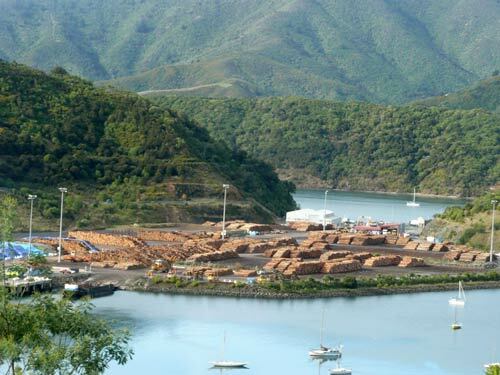 Harvested logs are shipped through the Waimahara wharf at Picton (opened in 2000), pictured here. Kaipūpū Point, visible on the left, had a predator-proof fence built across its neck in 2008 in order to create a ‘mainland island’ to protect native bird species.